Charles Fey is considered to be the inventor of the prototype of the modern slots we know them in today's gambling industry. He managed to invent the first reel slots ever with mechanical type of functioning. The event was dated 1895 and was soon imprinted into the gambling history forever as the real achievement in mechanics, alongside gambling. The magic mechanism was named Liberty Bell. As far as Fey was car mechanic by occupation, Fey managed to create a very simple mechanism with the three spinning wheels. The apparatus was made from the cast iron and weighed approximately 1 hundred pounds. It featured the range of ten special symbols on the every reel. The symbols depicted were a Spade, a Diamond or a Heart image on the spinning reels in addition to the symbol of the liberty bell. In general the mechanism was pretty simple in usage as on Holy Moly Casinos. The principle of the winning was the case, when the player had all 3 liberty bell symbols lined up. If all symbols coincided, the player was awarded with up to 50 cents. It was truly the first mechanism of such a kind. Though there were some mechanisms prior to the invention of Fey, they had no such an ability to conduct immediate payouts for the gamblers. In 1910 Fey had an opportunity to cooperate with the company called The Mills Novelty. This very company helped him to redesign Liberty Bell and manufactured the Mills Liberty Bell. In further models the replacement of the toes by ornate decorated with patterns feet. 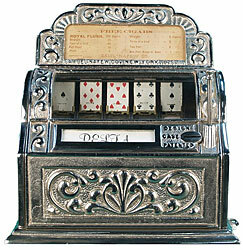 Thus, in 1910 the company produced the model of Fey's slot machine that was much slighter variant in comparison with the original Liberty Bell. The new machine had the gooseneck entry for coins and featured nowadays very popular fruit symbols. Fruit symbols are integral part of today's modern slots, indeed. The new machine was lighter and looked more attractive. Notwithstanding all the inconveniences of using the machine produced by Fey, it was still the great invention that produced stir in the sphere of gambling, as well as in mechanics of that time. It was contribution to the manufacturing and became later the symbol of the whole capitalistic era that substituted the long period of depression in The USA. Charles Fey was forever engraved in the history as the prosperous American inventor and entrepreneur, but not German immigrant from poor family.